Internationally acclaimed artist Tania Kovats (Course Director of MA Drawing at Wimbledon) explores the significance of our relationship with water and the world’s seas and oceans in a brand new sculptural work ‘Evaporation’, the second in the annual Cape Farewell ‘Lovelock Art Commission’. Taking James Lovelock’s Gaia theory – of the earth as an interconnected super organism – as her starting point, Kovats’ exquisite new sculptural piece explores global bodies of water and their crucial role as signifiers of climate change. Comprised of large metal bowls reflecting the shape of the world’s oceans lifted from the globe. Each bowl contains a solution of salt and blue ink that gradually evaporates in a hydro-cycle, leaving a jewel-like crust of salt crystals in concentric rings. This will be an object with its own tides; different each time a viewer sees it. 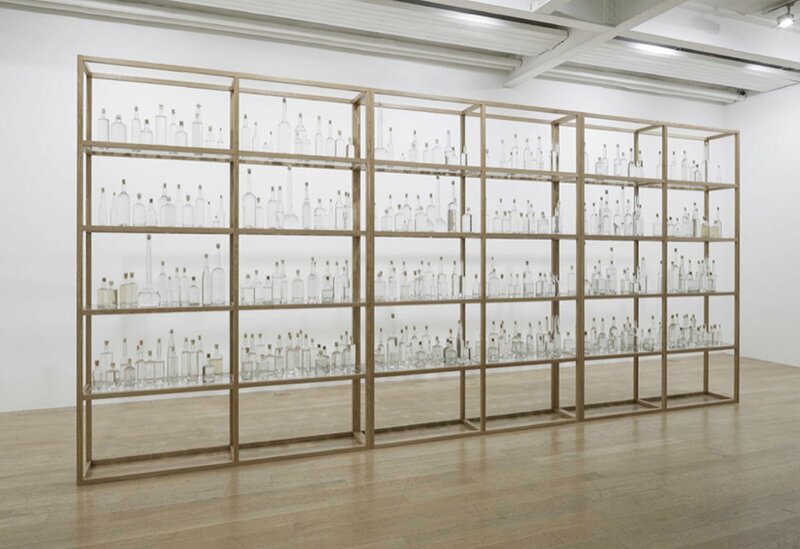 Alongside this work is ‘All the Seas’, hundreds of glass bottles containing water from each of the planet’s 200+ seas. This installation has been created with the help of a global network of people drawn in by the desire to bring all the waters of the world to one place. Throughout the exhibition water will continue to be added to the work, as the 36 remaining seas are collected for this striking and thought-provoking piece. Follow the hashtag #TheSeaStories to find out about new samples as they come in. BBC Proms ‘Gaia’ Composer Jonathan Dove will also bring world premiere of new composition ‘The Wave’ to this installation on the 25th October – a choral and instrumental piece responding to the work working with musicians from the Royal Northern College of Music. Lovelock’s work focuses much attention on the significance of the planets’ oceans as a barometer of its health. As global sea temperatures rise and the impact of pollution is becoming increasingly clear, this work is more vital than ever. Evaporation opens the Manchester Science Festival 2015. The exhibition is part of ArtCOP21. More information can be found online about other ArtCOP21 events and exhibitions. This entry was posted in Staff and tagged All the Seas, ArtCOP, ArtCOP21, Cape Farewell, Evaporation, Gaia theory, Jonathan Dove, Lovelock Art Commission, MA Drawing Wimbledon, Tania Kovats on October 15, 2015 by Claire. David Buckland, Director of Cape Farewell (CCW Graduate School partner), will be speaking at More Than Double Glazing, an inspiring international symposium about the innovative opportunities and chances that come with sustainable conduct in the arts at Het Nieuwe Instituut in Rotterdam, 11 December. In 2001 Buckland founded Cape Farewell, focusing on the notion that art can interrogate the future with some semblance of rigour. This has been analysed and researched and become instrumental in facing the challenge of climate change. He has co-curated a number of major climate art exhibitions: Art and Climate Change for the National History Museum, London 2006; Earth for the Royal Society of Arts; U-n-f-o-l-d which has toured worldwide; Carbon 12 for the EDF Foundation Gallery, Paris 2012; Carbon 13 for the Ballroom, Texas 2013; the Carbon 14 exhibition and festival, Toronto 2013/14. Buckland is a designer, artist and film-maker whose lens-based works have been exhibited in numerous galleries in London, Paris and New York and collected by the National Portrait Gallery in London, the Centre Georges Pompidou in Paris, the Metropolitan Museum in New York, the Getty Collection in Los Angeles and the Michael Wilson Collection amongst others. Five books of his photographs have been published, including works on the Trojan Wars and The Last Judgment featuring the sculptures of Sir Anthony Caro, and two monographs of his own work. He has designed over 20 stage sets, as well as costumes, for Siobhan Davies Dance, the Royal Ballet, Rambert Dance Company, Second Stride and Compagnie Cré-Ange. At the symposium speakers and founders of renowned institutes such as Julie’s Bicycle (Alison Tickell) and Cape Farewell will deal with the issue of how the art world can contribute in its own way to a more ecological world. The remarkable projects that these institutes have set up, their policies and the examples they have set across the globe will be discussed in great detail. Ian Rimington of Arts Council England will show how a sustainable attitude has led the institute to apply stimuli and encourage applicants to endorse the policy of sustainability. Artists Arne Hendriks, Yeb Wiersma and Miek Zwamborn will talk about their practices and the role that sustainability plays in them. Guy Gypens of the Kaaitheater in Brussels and coordinator of Imagine 2020 will explain the innovative power of durability in the theatre and its productions. Harmen van der Hoek will expound on the prominence of durability in the programme of Leeuwarden Cultural Capital 2018. The moderator is Tracy Metz. The full programme can be here and attendees can reserve a place by emailing register@janvaneyck.nl. The symposium is organised by the Jan van Eyck Academie Maastricht and takes place as part of The New Material Award exhibition and prize at Het Nieuwe Instituut in Rotterdam. This entry was posted in Partnerships and tagged Cape Farewell, David Buckland, Het Nieuwe Instituut, Julie's Bicycle on December 4, 2014 by Claire. Cape Farewell has been collaborating with the world’s leading climate scientists and its most influential artists to instigate a cultural response to climate change since 2001. The Cape Farewell team believe that climate change is a cultural, social and economic challenge, and they are inspired to move beyond the scientific and rational debate to address it. By bringing together artists, scientists, communicators and cultural opinion formers, they endeavour to develop creative works that act as a catalyst for change. By using creativity to innovate, they engage artists, writers, poets, musicians and film-makers for their ability to evolve and amplify a creative language, communicating – on an emotional level and on a human scale – the urgency of the global climate challenge. One of their creative outputs is to employ the notion of ‘expeditions’ – Arctic, island, urban and conceptual – to interrogate the scientific, social and economic realities that have led to climate disruption. Cape Farewell has so far made eight voyages into the high Arctic, ones to the Andes/Amazon, and more recently to the western islands of Scotland. This experience has prompted them to change from bearing witness to climate change to working pro-actively and in collaboration with island societies already de-carbonising their lives. Some of their work has been chronicled in the Graduate School’s publication Bright 9: Expedition. In parallel to their expeditions they organize a wide range of activities, from exhibitions, to poetry slams, festivals, concerts, and much more. This entry was posted in Partnerships and tagged Cape Farewell, Expedition on July 10, 2014 by Claire.